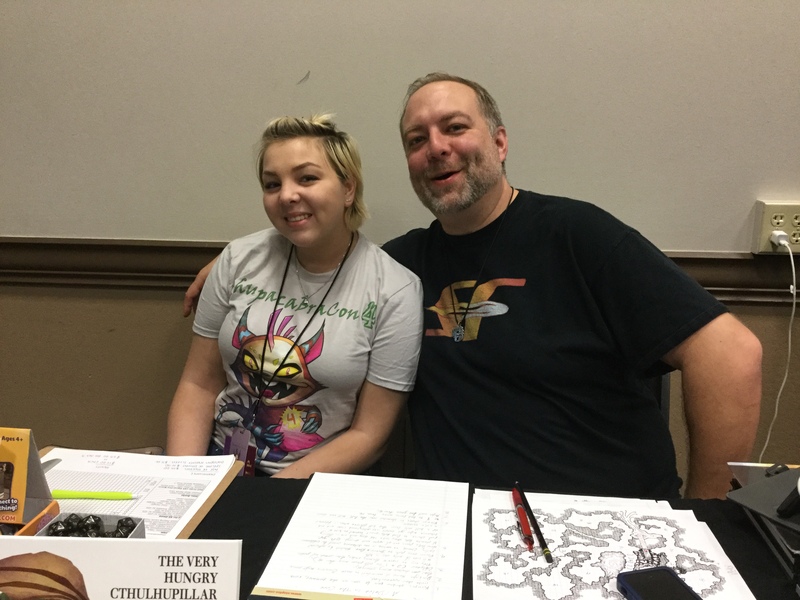 Over the weekend of May 13th Austin hosted it’s 4th annual RPG convention, Chupacabra Con 4! I’ve been watching this little convention grow year by year from buzz we heard on the internet, and from our customers back when we had the shop. However, this was our first year attending Chupacabra Con, as they invited us to take a look around as members of the legitimate press. Thats right, FMD is a totally legitimate news source, we got badges that prove it! As soon as we stepped inside we ran smack into legendary RPG designer and writer John Wick, fresh off the heels of his wildly successful new edition of 7th Sea – check out our review here. We had a lively conversation that we unfortunately weren’t set up to record, but he definitely appreciates the massive public response to the game. 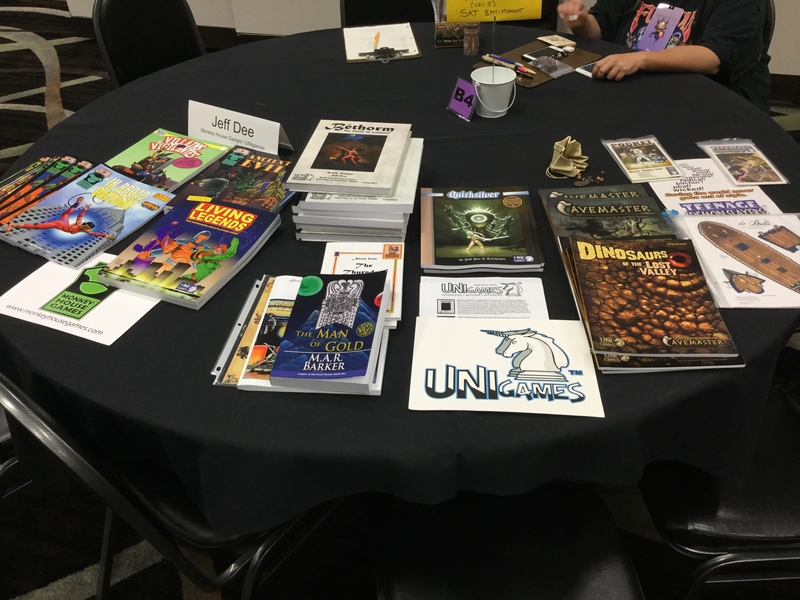 The convention had a selection of board games you could check out and play while you were waiting for your next RPG. The selection was pretty good with a lot of the core stuff you would expect, which is probably what you need for what is an RPG convention. The best part was they had several games that were “Play to Win.” Basically, if you took a specifically marked game, and you won, you could sign up to walk out of their with the game after the convention was over; it was a great way to make sure that some of the more obscure games got time off the shelf. The main draw of the first floor was the Dealer’s Hall, and there are so many people we are giving them a picture and a paragraph each! 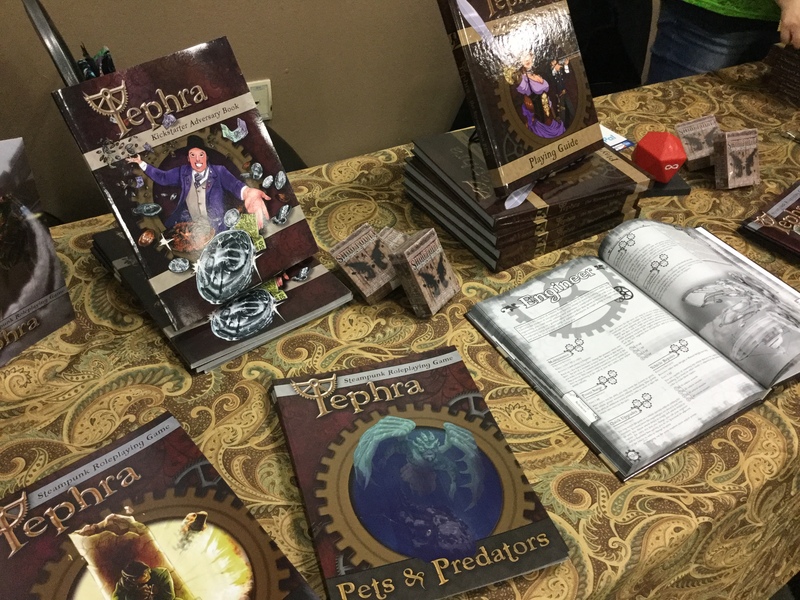 The company was at the con showing off several of the books they have Kickstarted over the last few years. It worked in our case, Robert brought the Total Party Kill Handbook and the Trap Compendium off of them. Both of these books are compatible with 5th edition and look great! 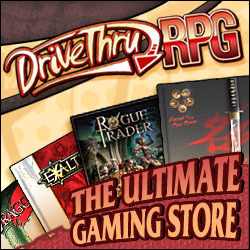 The best part was every physical copy of a game book you buy, you get the PDF from their website for free! Perfect for those of us who love physical books, but tend to get most of our reading done on a tablet. Plus author Steven Gordon is a super nice guy, we had a great chat! 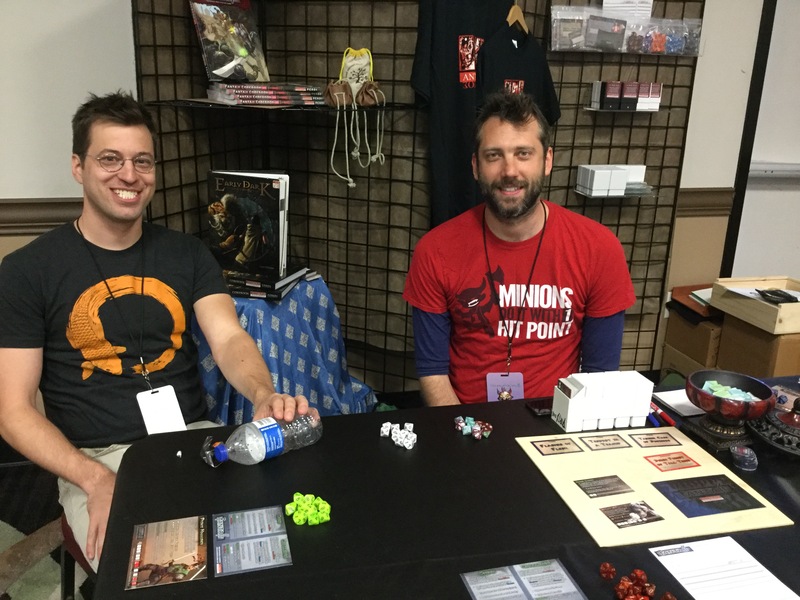 We got showed the ropes of how to play this super innovative universal RPG system by the head designer, Calvin Johns. Jonathan is already a huge fan and has talked about it on the show, but for Robert and Trev this was their first time seeing how it worked, and boy is it cool! Blending modern, narrative role-playing with fluid, JPRG inspired combat, this is definitely one to try if you get a chance. You can quickly set it up for a one shot in any genre you want with their many decks of theme cards, or make up your own genre with just some time writing down keywords on whatever cards you want to use yourself. The best part is if you get Calvin’s business card, it’s also a item for Fantajii: the Relic Blade. 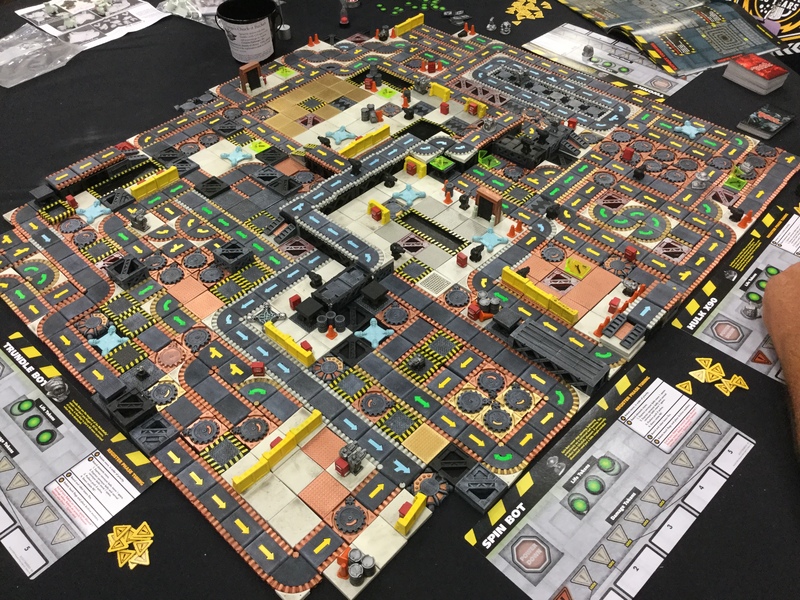 Rob had a chat with Game Designer Jamie Chambers, who has worked for Margaret Weis productions on several Cortex system games, among other things. He was at the con representing his company Signal Fire Studios. They had a great mix of RPGs, kids books, board and card games that his company creates. Our personal favorite was “The Very Hungry Cthulhupillar,” which Rob snatched up for his monster loving 5-year-old at home. Sharing a table with Uni Games was Jeff Dee, who had brought several of his Villains and Vigilantes books with him published by Monkey House Games. Unfortunately we were unable to talk with him as every time we dropped by he was either busy chatting with a gamer, or was gone at a panel. However, it was great to see that this classic superhero RPG was still getting some love. 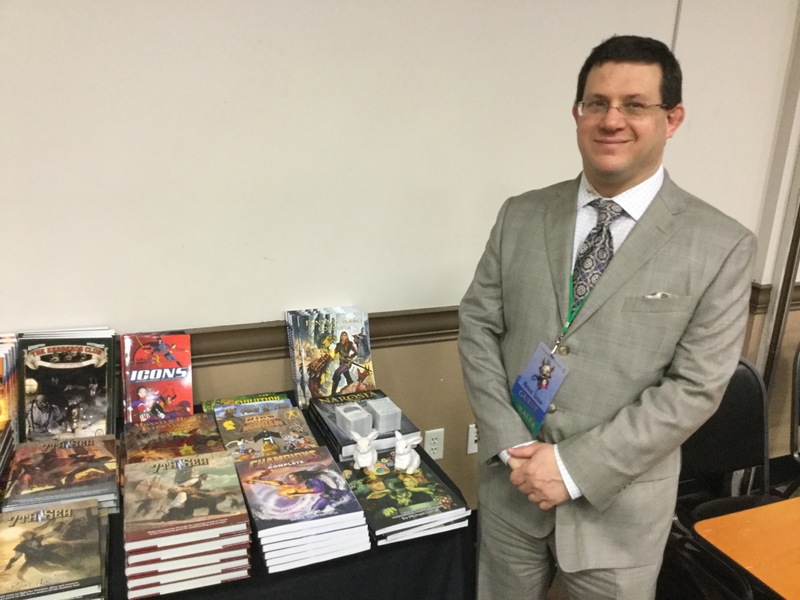 Writer of many super hero RPG books Michael Satran was there with his wildly creative scifi and horror adventures for Hero System, Mutants & Masterminds, and Savage Worlds. He is a truly unique voice in the RPG world and it was awesome getting to listen to him tell us all about his adventures, both writing them and the moments in the playtests when he revealed the plot twists. We are currently flipping through freshly signed copy of “Imaginary Friends,” which came, complimentary with a tiny bunny rabbit with sinister eyes. 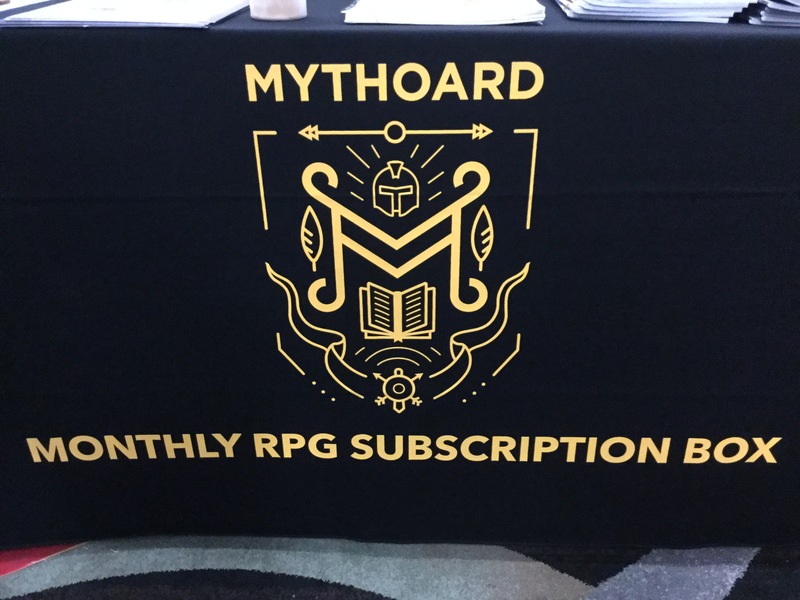 We had a great talk with this company, they were at the con showing off their Mythoard Subscription service, which has been providing RPG loot boxes since 2015. 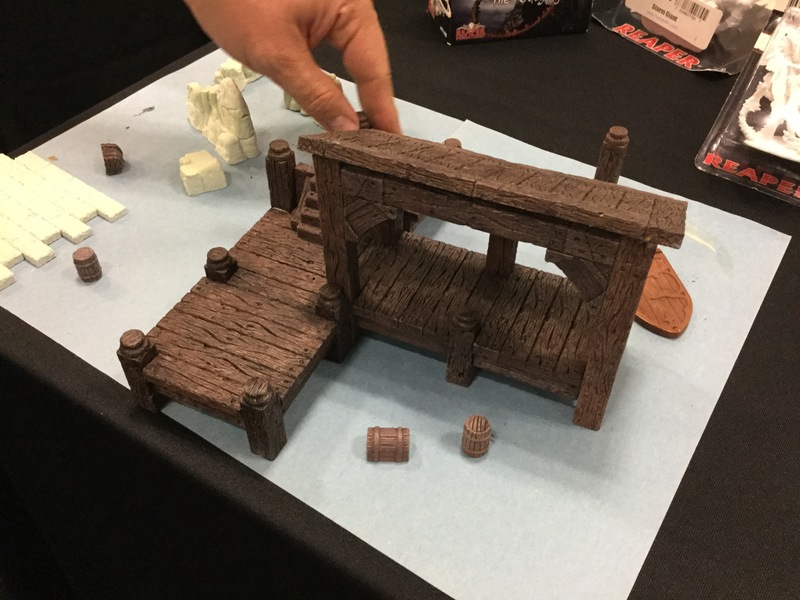 Also at the con, was a dock terrain piece which was there to give people an idea of what they wanted in their upcoming box Dwarven Crate! Which will give you terrain pieces for your RPG and miniature wargame needs. Also they gave us the super awesome scoop that they will soon have a Cthulhu Crate for all your investigative noir needs (with tentacles)! 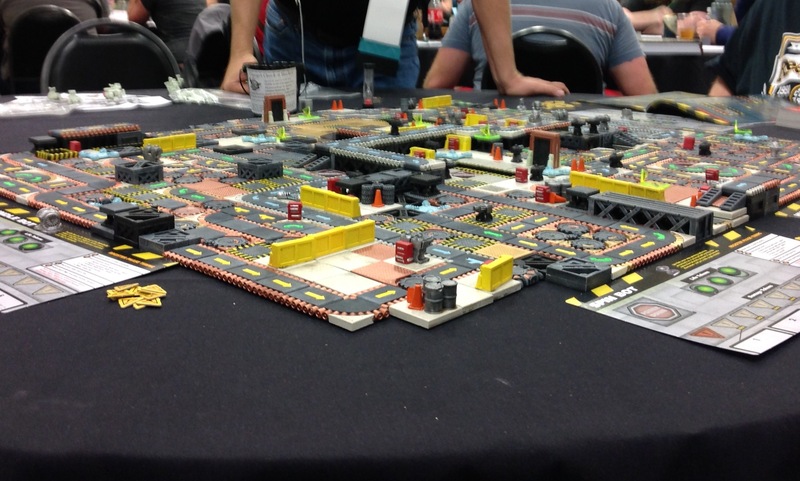 Also check out the awesome 3D Roborally board they made! 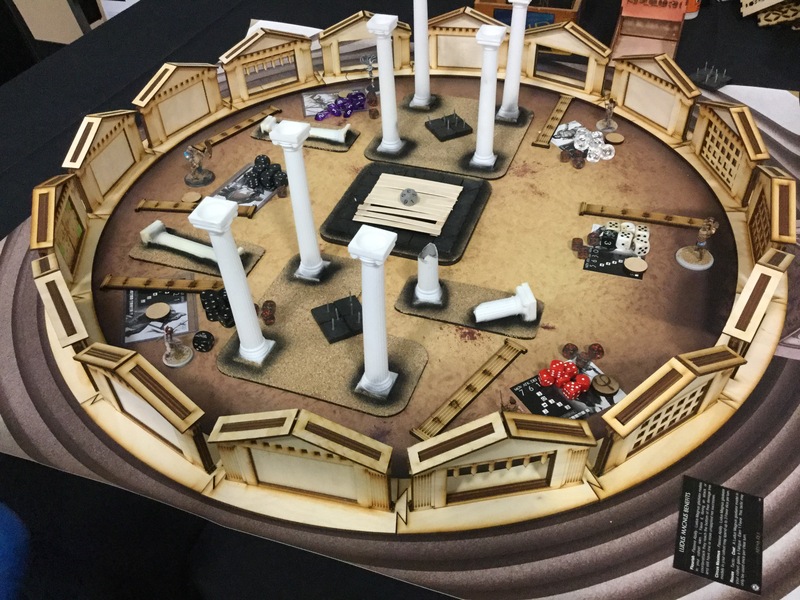 Timothy Martin was at the con representing NEWay Design, with a spectacular laser cut Arena Rex board, and some samples of the companies painting racks. Tim was a super nice guy, and we chatted for awhile about miniature games. Laser cut wood has really revolutionized terrain and niche models. Tim revealed to me that next up for him was designing a full Blood Bowl board, complete with grandstands, which sounds amazing, we can’t wait to see it next year. With a crazy amount of used RPGs, and Miniatures, this booth was super fun to pick through. Poking through the Facebook page it appears the owner rolls around to a lot of conventions, selling older RPGs and especially Miniatures. 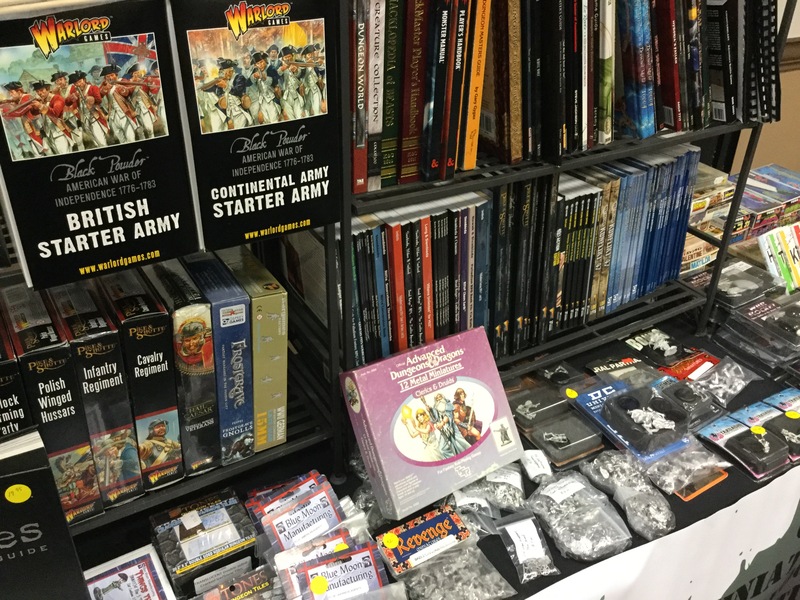 They had a lot of great old stuff, Ral Partha minis, loads of RPGs from the 90s, plastic anime spaceship models, and some new stuff as well. 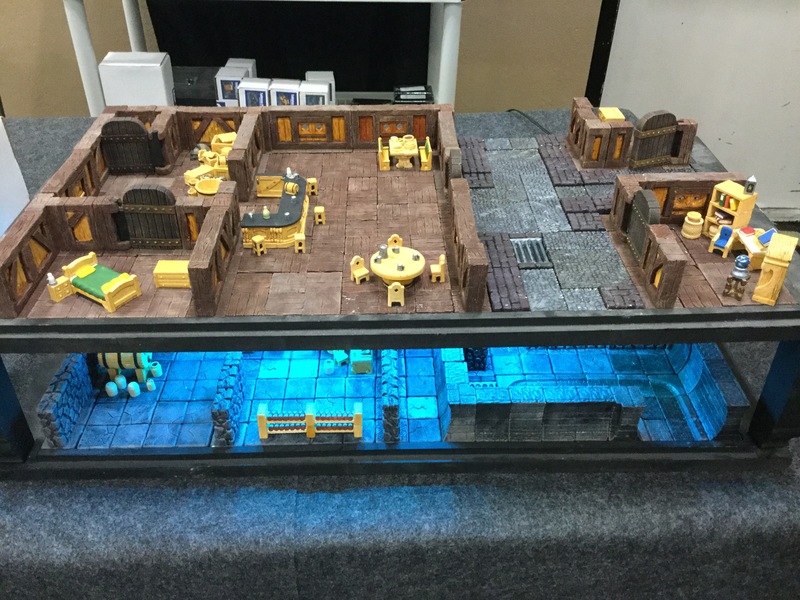 Another local Austin company, Table Top Plus makes fantasy dungeon terrain, and accessories for all your combat needs. Cast from resin, these terrain pieces are pretty awesome, and his two level layout of a Fantasy Inn and Basement really captured the imagination. Robert brought his 5-year-old to the con and she had a great time discovering all the cool details. 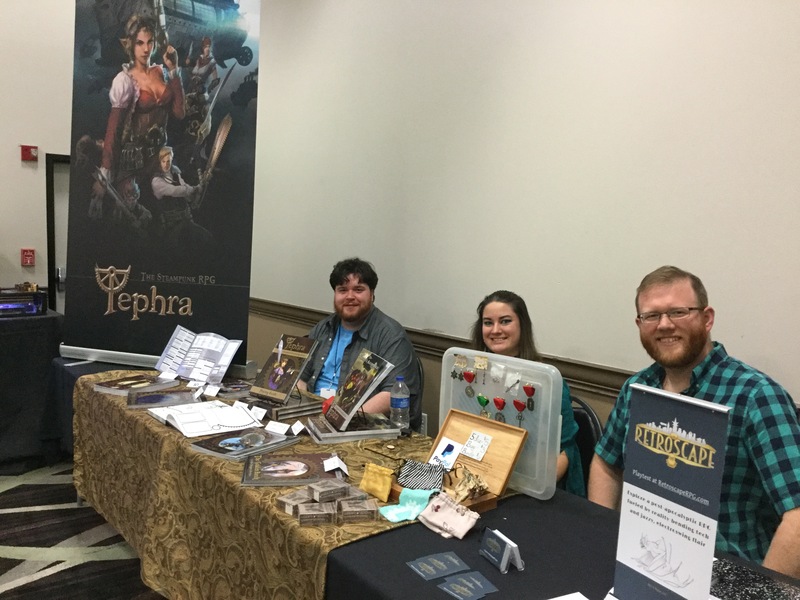 This scrappy local Austin crew was there with a bunch of books for their unique steampunk/fantasy game Tephra, as well as a sneak peak at their new game Retroscape. If you love your d12’s and don’t get to role them enough, their system uses it as the main die, and there are fancy hats and goggles aplenty. Lastly, the odd duck at this convention full of odd ducks. I’m not sure why a bathroom remodeling service was at the convention, but whatever, bravo for getting some out of the box sponsors of the event! 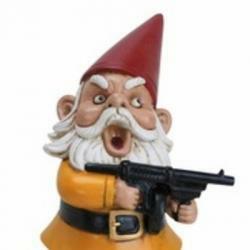 His neighbors were helping him brainstorm some tie-ins, we heard “Rubber Ducky RPG” bandied about. Hopefully the guy had a good time and got a few brochures out to the gamers that were in need of a new bathroom! 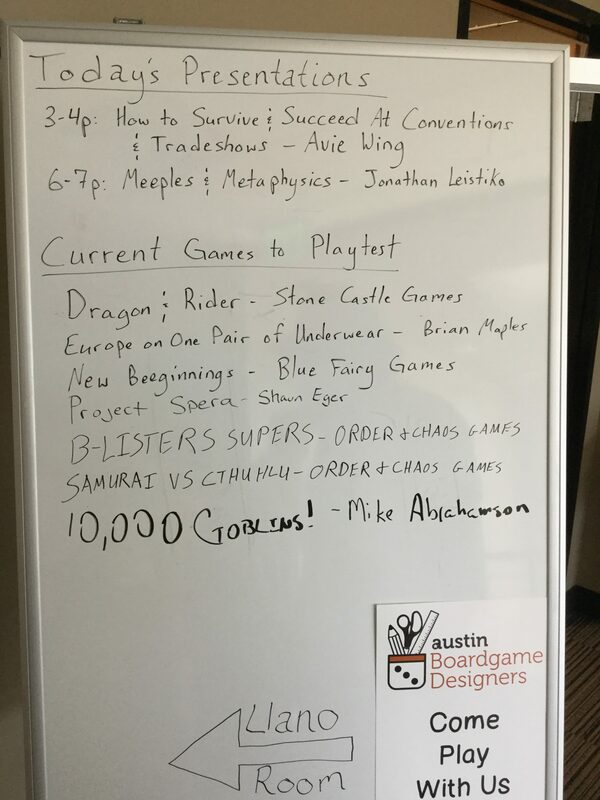 We got to check out some cool prototypes in various stages, including a dungeon-crawling dice game “10,000 Goblins” and an interesting 2-on-2 combat card game where one teammate is a dragon and the other is their rider, trying to predict each other’s action called “Dragon & Rider” appropriately enough. Chupacabra Con had several rooms dedicated to RPGs, which was a lot of fun because we ran into a lot of old friends from the local RPG community. The rooms took up almost the entire second floor, and with a handy vending machine with both snacks and soda, you barely needed a reason to leave. D&D and Pathfinder had their own rooms which were filled to the brim with awesome, even when the con first opened on Friday afternoon there were several tables in both rooms with adventure happening! There was a Star Wars and Heroes of Rokugan room which was also always packed, when we dropped by Star Wars was in full swing. Hearing the hum of droids, blasters, and nerf herders in the air is not something you get every day. 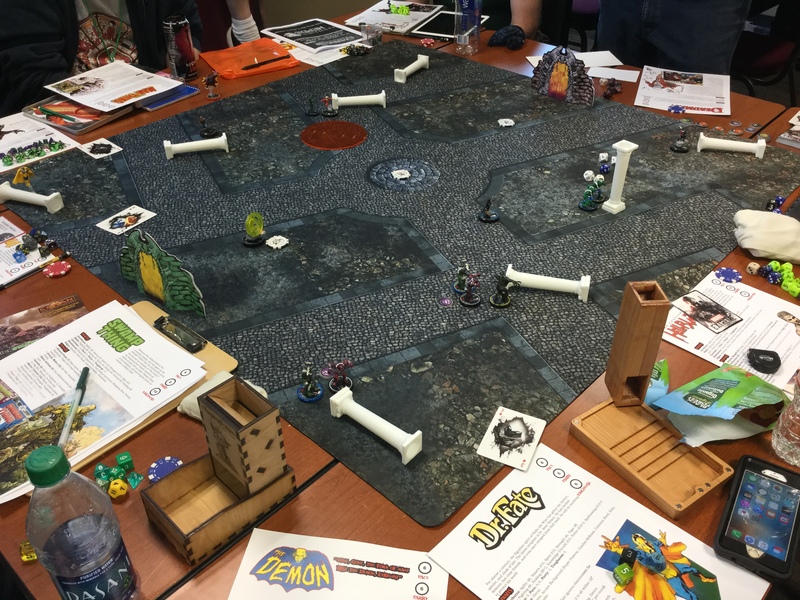 Lastly there was the Savage Worlds RPG room, which when we dropped by was playing a awesome game of DC vs Marvel. The tables were pushed together, there was a 4×4 gaming mat, and everybody had different mostly C list characters, in a team battle so fraught with copyright, I’m surprised we were able to get a picture without a lawyer magically popping up to block the lens. This game in particular looked like great fun, there were several people watching, lots of laughing. This was the kind of event you can only see in a convention. We didn’t get a chance to poke our head in there, but the weekend was packed with classes and speakers. The con was able to bring out a fair amount of special guests, so the schedule had a lot of interesting stuff on it. There were a lot of fun goodies up for silent auction, from new RPGs signed by the creators, to some classic item that are hard to get, to Kickstarter exclusives, to a gigantic pile of Lord of the Rings action figures. The highlight, at least in our opinion, was the Deadlands 20th Anniversary Whiskey Box. Lastly we end the con with how they were raising funds for charity. 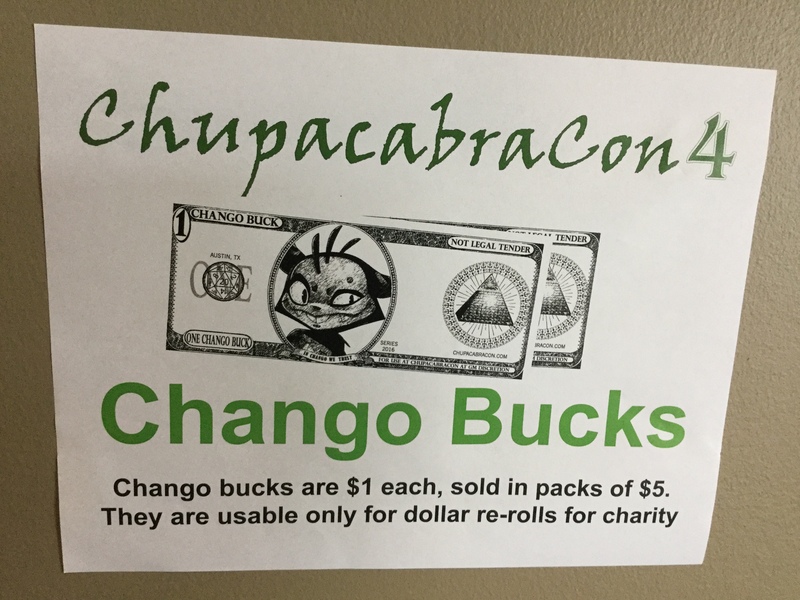 At the con, by the front desk (which was also stocked with an assortment of RPGs by the guests), you could buy “Chango Bucks.” Pieces of paper that kinda looked like money, with the Chupacabra Con mascot on them, you had to by a 5 pack for $5. All the money went to charity, and you could use those dollars to buy a reroll in any game you were playing at the convention. Which was a nice touch, especially when people get into the spirit of it. True to the spirit of the site’s name, we forgot to check out some stuff. Apparently there was a multi-media room somewhere, that you can do a live cast from, but unfortunately we couldn’t get the whole gang together. 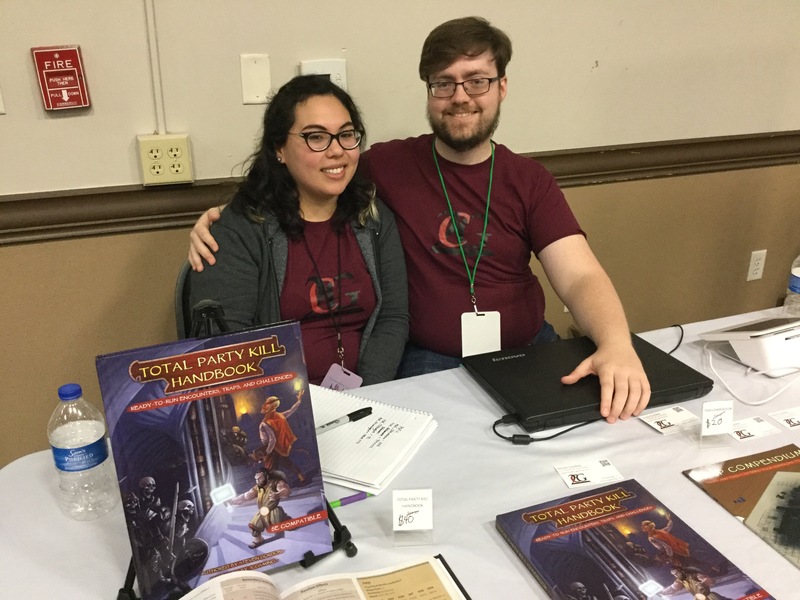 More importantly, we didn’t get the chance to sit in on any games, which is kind of the point of an RPG convention, but maybe next year!